It looks like this game should be a lot of fun! It will hit the US in January. 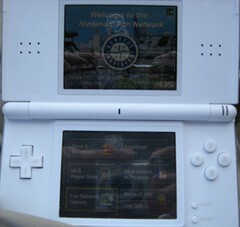 Nintendo has teamed up with the Seattle Mariners for a pilot program in their stadium. People can bring their DS to a game, and for $5 ($30 for 10 games) load it with software that ties the device into the stadium’s WiFi network. Then, the users can order food, play trivia games, and watch video replays of the action on the field. This is such a cool concept, and looks to be a great execution. I could see this being used at a NASCAR race to show everyone the position of their favorite drivers on the track. Or how about at a Basketball game to show the number of points each player has scored so far, or who’s about the foul out. The DS has been one of the best selling devices in history… is the install base large enough for something like this to catch on? The hardware is not particularly expensive at $130, and if enough places utilize it this way the cost may be justified. Can enough parents just borrow the kids’ DSs? It’d be nice if this type of solution could be rolled out for an open set of hardware… a sort of intranet website with this functionality, but without the ability to control the target hardware things like interface and streaming media become very difficult to pull off well. So what do you think? Is the DS the perfect platform for event-augmentation? What other applications do you think would have a chance to becoming popular? Will a day come that our cellphones are standardized enough to log onto a local network for this sort of thing? Recently Stumbleupon Video launched a Wii version of the site that automatically detects the Wii Opera browser and formats the content for the Wii/TV. To me, the most notable thing that they did was add Wii Remote D-pad support for navigating videos and rating what you like/dislike. Their flash application was pulling button presses straight from the remote, not just clicks from the A button. Nintendo is allowing all of the key presses from the remote to not only hit the browser, but to also be accessed by online applications. This morning I saw some related news that really caught my interest. WiiCade is proud to announce the immediate availability of software that unlocks Nintendo Wii Remote functionality previously unavailable to online video games. This Application Programmer Interface (API) allows Flash developers to utilize the full range of buttons on the wireless remote device. Additionally, the API gives developers the potential to detect multiple, simultaneous button presses without interfering with the pointing capabilities of the remote; a feature not seen in previous APIs. I have really been amazed how application development for the Wii has not come to us through unsigned code exploits or hardware mod chips, but instead through the browser. When people want new functionality they write a website for it designed specifically for the Wii. Wiiminder added tabbed browsing, not by modifying the code of the Opera browser, but by making a website that loads multiple pages and provides pop-up toolbars, all with web technologies. I feel like this Wiicade API will mark the beginning of a whole new wave of Wii Flash games that will progressively blur the line between a game you play online and a game you buy on a disc. I’m hoping that the retail release of the Wii Opera browser will provide a much needed autohide function for the browser toolbar. I believe that if that happens, we may reach a point where Wii applications hosted on the internet achieve a level of maturity that rivals Nintendo’s own offerings in the dashboard. I can’t wait.